Clyde hat-trick hero David Gormley will be on familiar ground when the Bully Wee travel to face Ayr United in Saturday’s Cup showdown. The last 16 of the Scottish Cup may be uncharterted territory for the Bully Wee in recent season. But at least Gormley will feel at home at Somerset Park, having spent 18 months there at the start of his senior career. Gormley’s treble got Clyde past Stirling Albion in a dramatic fourth round replay at Broadwood last Tuesday night. And while Barry Ferguson’s men go into the match with Championship side Ayr as underdogs, 28-year-old Gormley believes they can cause an upset and reach the quarter-finals. He said: “I’m looking forward to going back to Ayr. I had a great time there and played a lot of games with them. “Somerset is a good ground and they get good crowds. I still know the chairman as well. Ironically Gormley’s man-of-the-match display followed what he said was “probably the worst game I’ve had in a Clyde jersey” in the previous Saturday’s 2-1 home defeat by Arbroath. He said: “I don’t really know how to sum up the difference in how I played tonight. “I think I’m a confidence player, if I start the game well I seem to go on from there. After scoring the first one I was on a bit of a high. The match will be Clyde’s first in the last 16 match for 11 years - their last appearance at this stage came in 2006 when they were beaten 4-0 at Gretna. A quarter-final place awaits the winners of Saturday’s tie and the last time Clyde achieved that particular feat was in 2005 when they were beaten 5-0 by Celtic at Broadwood. 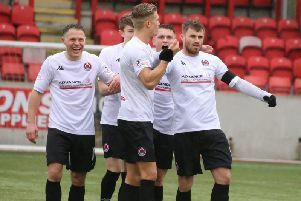 The game will be the first Scottish Cup clash between the sides since a second round tie in January 1997 - also at Somerset Park - which Clyde won 2-0 with goals from Eddie Annand and Martin O’Neill.